Whenever I discuss frugal issues, someone usually brings up the argument that you’re better off focusing your energy on earning more money instead. While I certainly appreciate the value of earning more, I argue that spending a dollar less is significantly more valuable than earning a dollar more. On what facts do I base this unabashed bias towards penny pinching? Two big advantages come right to the forefront. First, the money you save from cutting spending isn’t taxed – more income is taxed. Taxes always benefit the frugal person. If you save $100 this year on household goods at the department store, your actual cash savings is $105 to $107 – you’re not paying sales taxes on those items. On the flip side, if you’re in the 33% tax bracket, you have to earn $150 in order to bring home that same $100. Every time you take a frugal step, your savings is after taxes – meanwhile, any increases in earnings that you accrue are still yet to be taxed. 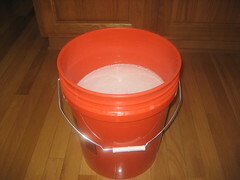 A great example of this idea at work is our homemade laundry detergent recipe. I can make a batch of this in fifteen minutes – in other words, four batches an hour. Since each batch equals fifty two loads and each load has a savings of seventeen and three-quarter cents, you can save $36.92 in an hour’s worth of work. If you had used that $36.92 to buy laundry detergent, you would also have to pay 7% sales tax, costing you at total of $39.50. But that’s just the start! Let’s say, hypothetically, that you’re in the 25% tax bracket. To make back that $39.50, you’d have to increase your income by $49.38. Let’s say you’re making $15 an hour – you’d have to work for three hours and twenty minutes to take home as much as you would from an hour of making homemade laundry detergent. Second, savings tactics stand alone – you can’t increase your earnings in fifteen minutes. Frugal tactics are immediately effective when it comes to your bottom line. If you spend fifteen minutes making a grocery list and stick to it at the store, that time spent immediately results in more money in your pocket. Meanwhile, if you spend fifteen minutes of your time networking for your career, it earns no immediate dividends (unless you’re lucky enough to immediately make a sale of some sort). Instead, it just contributes a bit more to the stability and long-term potential of your career – not really a big help when you’re trying to make ends meet this month. Let’s say you’ve got $100 in your checking account, for example, and you have a $90 electricity bill due. You also need laundry detergent to wash your clothes. What do you do? My suggestion would be to get the ingredients for that homemade detergent and spend fifteen minutes making your own detergent. Unless you happen to be a salesman on commission, no amount of networking is going to get your clothes clean. So what advantage does earning more have over spending less? To put it simply, you can only cut so much spending – while you can always earn more. A career built with passion and focus is like a snowball rolling down the mountain – the income keeps building and building and building. But it’s a slow build – and it’s one that has to work against the counter-forces of taxes and time, two things that many people simply don’t have in their favor when they’re trying to turn their financial ship around. I’ll stick to using both tactics, thank you. I’ll work hard to keep that career snowball rolling down the mountain – but I’ll keep making my homemade laundry detergent until you pry the borax from my cold, dead hands.